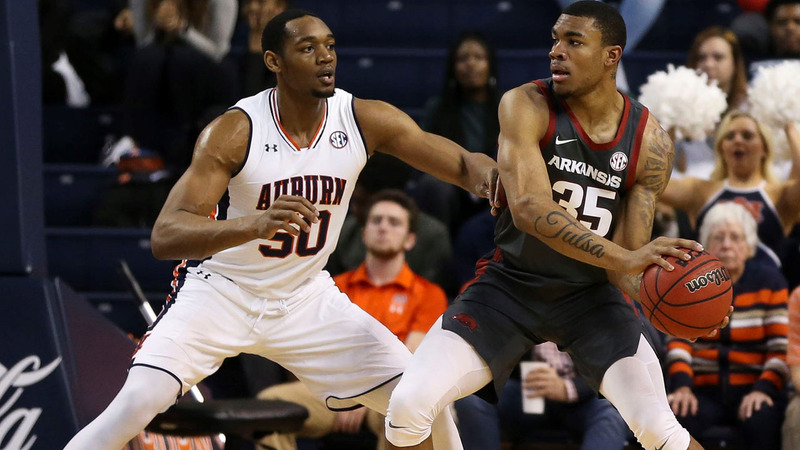 AUBURN, Ala. – Bryce Brown scored 18 points and contributed five 3-pointers to Auburn’s long-range barrage in a 79-56 win over Arkansas Wednesday night. The Tigers made first 5-of-their-first-6 from 3-point range and took a 22-1 lead to start the game. On the other end, Arkansas missed its first eight shots from the field until Gabe Osabuohien hit a jumper at the elbow at 12:57. Auburn ultimately built a 30-point lead and took a 45-20 lead into the locker room at halftime. Arkansas showed some fight in the second half, out-scoring the Tigers 36-34, and committing just four turnovers while going 12-of-18 at the free throw line. Overall, Auburn made 17-of-33 3-pointers while the Razorbacks were just 4-of-26. Brown made 5-of-8 3’s to lead four Auburn scorers in double figures. Anfernee McLemore scored 13 points while Chuma Okeke had 11 points and five assists. Jared Harper scored 10. Arkansas’ Isaiah Joe launched freely in a battle of the SEC’s two most prolific 3-point shooters, himself and Brown. Joe scored 14 points and made 4-of-14 3’s. Daniel Gafford had 10 points and eight rebounds for the Razorbacks. Arkansas returns to Bud Walton Arena this Saturday (Feb. 23) to host the Texas A&M Aggies. Tip-off is set for 7:30 pm. Arkansas’ starters were Isaiah Joe (G) – Jalen Harris (G) – Mason Jones (G) – Adrio Bailey (F) – Daniel Gafford (F). This has been Arkansas’ starting lineup in 24 of its 26 games. Auburn won the opening tip. Auburn’s Anfernee McLemore scored the first points of the game, 1 3-pointer at 19:50. Jalen Harris scored Arkansas’ first points, a free throw at 17:54. Isaiah Joe hit four 3-pointers to remain the SEC leader in 3’s made with 91 while moving to seventh on the school’s single-season list. In the second half, Arkansas started Isaiah Joe, Daniel Gafford, Desi Sills, Gabe Osabuohien and Keyshawn Embery-Simpson. Isaiah Joe took two charges and leads the team with 22 taken this season. He also had a steal and leads the team in that category with 39. For the eighth time this season, Arkansas forced 20-plus turnovers in a game, forcing 21 at Auburn. The Razorbacks have forced 432 turnovers this season – second-most in the SEC.